"The Green Bridge Of Wales" . A natural arch formed by marine erosion of a narrow strip of headland. Has the look of a Flying Buttress . 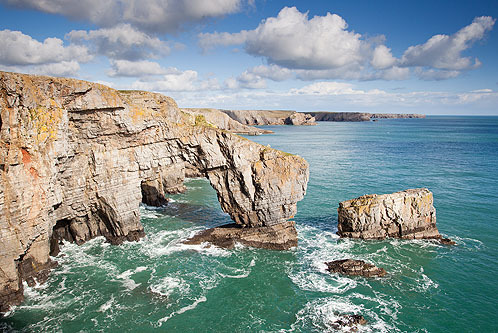 One of the most Photographed scenes on the Pembrokeshire coast. A pic taken on March 17th 2012 . It may be possible to see a white blob on the Arch of the bridge - a Sheep with a Lamb !.